Preview: Looking at the quarterfinals, you have Koneru Humpy and Hou Yifan in the same bracket. That is unfortunate and probably an oversight. Apparentely, Alexandra Kosteniuk is the top seed as World Champion, but it still would not explain Humpy and Hou in the same bracket since they would be #2 and #3. It appears as if Kosteniuk was given the best chance to defend. This could be an “all-Chinese” semi-final, or it could be India vs. China semi-final. Ruan Lufei is in good form and her matchup with Dronavali Harika will be a major fight. Ju Wenjun can possibly be a difficult opponent for Koneru Humpy. Uncertain of their head-to-head record, but Ju is a very determined fighter as are all of the Chinese. Almira Skripchenko will be a heavy underdog versus Zhao Xue, but her games against Viktorija Cmilyte were impressive. Hou-Lahno will be a good matchup of experienced players… both legitimate Grandmasters. There is no rest day until after round #5. Favorites bolt out front… Hou Yifan and Humpy Koneru stike first! will try to take the match to blitz tiebreaks after loss. Hou Yifan and Koneru Humpy advance for epic match! Zhao Xue joins them and will be a part of an all-Asian semifinal. Of course there is always talk about the Russian tradition in chess. However, in the past 20 years, China has dominated women’s play and stand a good chance to bring the crown back to China after a short reign by Alexandra Kosteniuk. India is also in the conversation when it comes to the rising powers of chess. 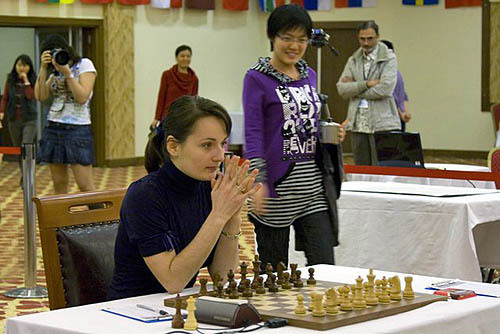 GM Kateryna Lahno waits patiently as a very cheerful Hou Yifan arrives at the board. Very interested spectators in background including Koneru Ashok, father of Koneru Humpy and Wang Qian, mother of Hou Yifan. Photo by wwcxc2010.tsf.org.tr. With Viswanathan Anand firmly ensconced as the World Champion and having won Junior Championships, the only championship left is the women’s crown. India will have the top-seed player in Koneru Humpy going for her first title. In fact, Humpy lost to Hou in the 2008 semifinals to stop India from taking four world titles in one year. 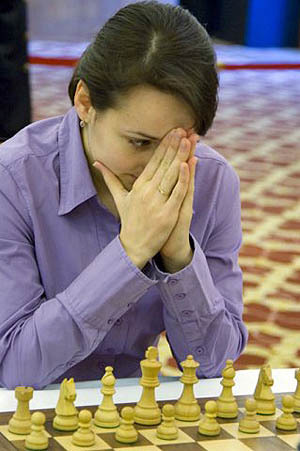 She will again face Hou Yifan in an epic battle of two fierce rivals. With the elimination of both European contestants, it will be an all Asian tournament, but Dronavali Harika and Ruan Lufei will play tiebreaks after their second draw. Ruan beats Harika in tiebreak. She join two compatriots as China is guaranteed to have a final contestant. 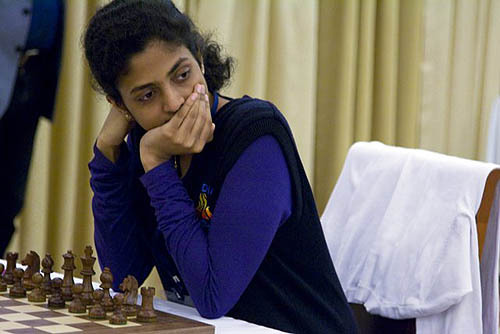 Dronavali Harika, former Girl’s Junior Champion, was unable to make headway against her Chinese rival, Ruan Lufei. Photo by wwcxc2010.tsf.org.tr.